I started scrapbooking when I was in high school. Back then, we only had those old-fashioned scrapbooks — heavy, rustic-looking albums which contained thick construction-paper type gray or cream-colored pages. We used everything from tape to glue sticks and black photo corners to hold the pictures (and other memorabilia) on the pages in those days. I’ve been scrapbooking the acid-free way since 1993. 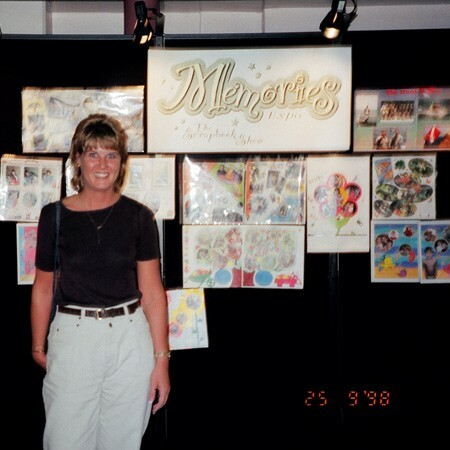 When I was living in Orlando and working at UCF co-worker and I went to a Creative Memories class for the first time. The CM rep showed us all of her albums (one for each of 5 kids) and they each looked so cute! It made me want to preserve my own memories in that way — right away. And I hoped that when the day came that I got married and had kids I would be able to make such fun scrapbooks of our memories together. From that day on, I’ve been organizing all my photos, all my negatives, all the topics I want to cover in my albums, lots of creative titles and photo captions that I eventually want to use, and thousands of different scrapbook page layout ideas. It only took me 5 months to complete my first album that was titled “My So-Called Life”. 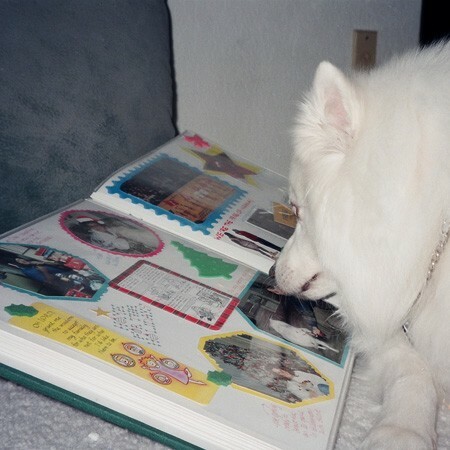 It was filled with photos from all my long-distance biking trips, fun times living in Orlando, and my dog, Jersey. Later, I decided to go all the way back and start documenting everything from my birth (my birth certificate, photos of my parents at that time, and memorabilia from those days) to my childhood (mostly family photographs), high school (I had lots of fun memorabilia from these days) and beyond. 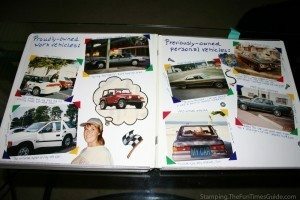 I ended up removing everything that was in the old-fashioned scrapbooks I had made and create brand new 12×12 Creative Memories albums to hold those items instead. Today, my collection of completed scrapbooks currently includes 14 completed albums. They’re all 12×12 scrapbooks with strap-hinged pages. This photo shows my scrapbooks and photo albums on a bookshelf in our home office, along with some of the scrapbook supplies that I use most on those shelves. I like scrapbooking so much because it’s a way to put my entire life in perspective, while incorporating my favorite pastimes of photography, writing, and organizing. Ever since I can remember, I’ve loved looking at photographs — mine, our family’s, and other families’. You can learn so much from the candid shots stored inside a photo album (or a shoebox, whatever the case may be). Scrapbooking comes naturally to me. I enjoy the process as well as the outcome — everything from laying out the pictures, to choosing the colored papers and backgrounds, to placing the stickers & diecuts, and writing creative titles and photo captions. I’ve always had an eye for detail, and layout & design has always been something I’m good at. Even before I started scrapbooking, I was always looking for a more “creative” way to do things on a daily basis. When I was single and living in Orlando, I turned my living room into a round-the-clock “Scrapping Zone”. My dog Jersey has always got to be in the middle of things, and he lends a helping hand (in his own special way) whenever he can. I’ve been to a few different scrapbook conventions. 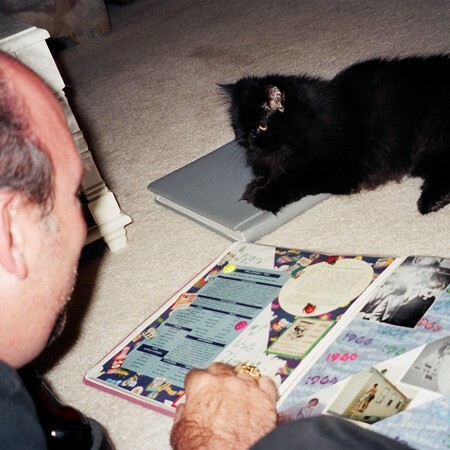 My scrapbooks were the cat’s meow on this night I guess you could say that scrapbooks are pet-friendly! P.S. I am married to a wonderful man, who not only tolerates but completely supports my addictive scrapbooking hobby. Scrappin is like life… it’s a work in progress. Here, I’m preserving my best memories in a scrapbook, because I believe that if my life’s worth living, then it’s worth recording. And my memories deserve more than a shoebox! Scrapbooking changes your perspective of things. I now live my life through the lens of a camera! Here, I’m going through my many years of photo negatives, trying to decide which ones I want to transfer onto CD for permanent archival storage. Are You A Scrapbooker Or A Life Artist?